Producers of Plywood Components in Ukraine – for furniture production. 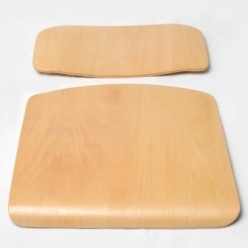 Moulded plywood components are widely used in furniture production. These are seats and backs of chairs, legs, sides of the chars and arm-chairs, stool seats, support furniture, table legs, armrests, boxes, etc. Moulded plywood components are much easier and cheaper than parts from massive wood, and are more convenient to assemble. In the production of moulded plywood components we use only environmentally friendly raw materials, growing in the ecologically clean region of Ukraine. Our moulded plywood components meet international environmental standards and are used in the production of school and office furniture, upholstered furniture. Offered products comply with all necessary regulations. We manufacture moulds according to your drawings or produce parts on your moulds.